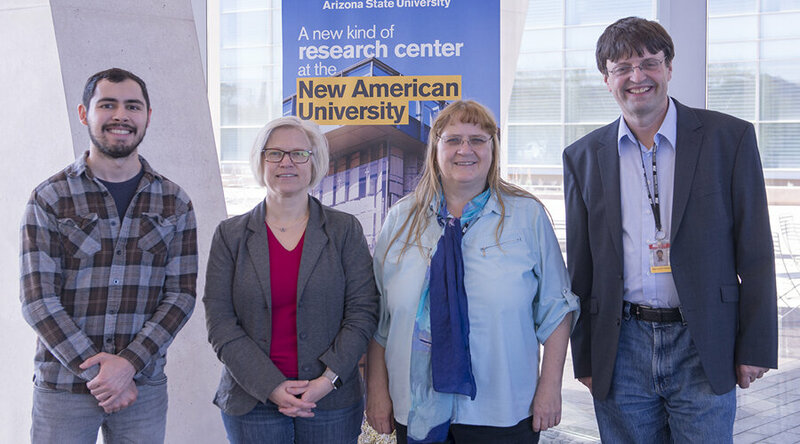 For the first time, scientists from ASU's School of Molecular Sciences in collaboration with colleagues from Albert Einstein College of Medicine in New York City have captured snapshots of crystal structures of intermediates in the biochemical pathway that enables us to breathe. Published today in the Proceedings of the National Academy of Sciences—Snapshot of an Oxygen Intermediate in the Catalytic Reaction of Cytochrome c Oxidase—their results provide key insights into the final step of aerobic respiration. "It takes a team to conduct such a sophisticated experiment," explains SMS's associate professor Alexandra Ros who, together with her graduate student Austin Echelmeier and former intern Gerrit Brehm, developed the hydrodynamic focusing mixer making these experiments possible. The mixer is a microfluidic device, which is high-resolution, 3-D-printed and enables two streams of oxygen saturated buffer to mix perfectly with a central stream containing bovine cytochrome c oxidase (bCcO) microcrystals. This initiates a catalytic reaction between the oxygen and the microcrystals. This research was instigated by a conversation between SMS's professor Petra Fromme, director of the Biodesign Institute's Center for Applied Structural Discovery (CASD), Raimund Fromme, SMS associate research professor, and professor Denis Rousseau from the Albert Einstein College of Medicine in New York City who works on the structure of cytochrome c oxidase, a key enzyme involved with aerobic respiration. Researchers at CASD including ASU's Richard Snell professor of physics, John Spence, helped to pioneer a new technique called time resolved serial femtosecond (millionth of a billionth of a second) crystallography (TR-SFX). This technique takes advantage of an X-ray Free Electron Laser (XFEL) at the Department of Energy's (DOE) SLAC National Accelerator Laboratory, Stanford. SFX is a promising technique for protein structure determination, where a liquid stream containing protein crystals is intersected with a high-intensity XFEL beam that is a billion times brighter than traditional synchrotron X-ray sources. While the crystals diffract and immediately after are destroyed by the intense XFEL beam, the resulting diffraction patterns can be recorded with state-of-the-art detectors. Powerful new data analysis methods have been developed, allowing a team to analyze these diffraction patterns and obtain electron density maps and detailed structural information of proteins. This new "diffraction before destruction" method has opened up new avenues for structural determination of fragile biomolecules under physiologically relevant conditions (at room temperature and in the absence of cryoprotectants) andwithout radiation damage. In summary, the TR-SFX studies have allowed the structural determinationof a key oxygen intermediate of bCcO. The results of the team's experiments provide new insights into the mechanism of proton relocation in the cow enzyme as compared to that in bacterial CcOs, and paves the way for the determination of the structures of other CcO intermediates, as well as transient species formed in other enzyme reactions.